This guide is for the Nintendo DS version. For the console versions, see The Sims 2: Pets (console). For the PC expansion pack, see The Sims 2: Pets. For the Game Boy Advance version, see The Sims 2: Pets (Game Boy Advance). 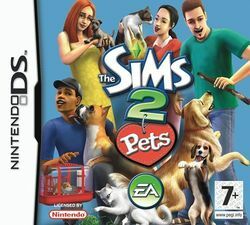 While you don't get the open-ended gameplay of the other versions of The Sims 2: Pets, you do get fun in a pet-care career in the Nintendo DS port of this game. In this game, you're charged with caring for the pets in the neighbourhood. You'll have to heal them and train them. Take them to the park and trade objects and pets with your friends.